It’s too late to plant pumpkins. You’ll have to start those earlier next year. But for most of you across the country, it is time to start the planting of the fall garden. 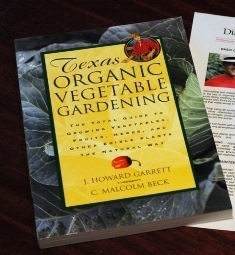 For a good basic guide, take a look at the vegetable book that Malcolm Beck and I wrote, Texas Organic Vegetable Gardening.The information is appropriate for most of the country, with some adjustments of timing. Generally healthy fall crops include broccoli, cauliflower, garlic, cabbage, kale, radishes, turnips, carrots, and green onions. Vegetables high in beta-carotene that have shown strong effects against lung and other cancers include carrots, spinach, broccoli, kale, and Brussels sprouts. Because of more available minerals in healthy soil, organically grown foods have more minerals, thus more sugar. That’s right: Taste and food value go hand in hand. Many herbs can also be planted now. Oregano, garlic, chives, parsley, salad burnet, comfrey, coriander, rosemary, thyme and lavender are just some of the cool season choices. Newly planted tender plants will have to be protected if the weather drops dramatically. Floating row cover can be used in the South; stronger protection is needed in the northern parts of the country. Preparing Vegetable Beds. One of the most important aspects of new bed preparation for food crops, and herbs to a lesser degree, is well-tilled or hand-worked beds. Aerated soil is critical to proper root development, and root development is critical to plant health. After the beds have been tilled up to a depth of at least 8 -10 inches, you should never walk on those rows again. Wide seed beds (15 -16 inches or more) are the best for vegetables. They can be as wide as 4 feet so that 2 feet of bed can be worked from both sides without having to step into the bed. Footsteps around growing plants can severely damage the health of the soil and the roots of plants. If compaction is carefully avoided, year after year tilling is unnecessary. Tilling is in fact detrimental to healthy soil. Prepare new planting beds by scraping away existing grass and weeds, adding a 4 - 6 inch layer of compost, lava sand or Azomite at 40 - 80 pounds, organic fertilizer at 20 pounds, and sugar (cornmeal and dry molasses) at 10 pounds per 1,000 square feet, and tilling to a depth of 3 inches into the native soil. Excavation and additional ingredients such as concrete sand, topsoil, pine bark and peat moss are unnecessary and can even cause problems. More compost is needed for woody plants and flowers than for herbs and low growing groundcovers. Fall gardening can be extremely productive and it’s definitely a lot of fun. Give it a shot. The time is now.